Rev. G. Scott Morris, M.D. I was born in a little town that no one has ever heard of, yet everyone in Memphis has probably driven through: Locke, TN. Do you know the intersection of Benjestown and Cuba-Millington roads near Shelby Forest, where that little general store is? At the time I was born, almost exactly one mile south of there on Locke Road, there was a little shack sitting out in the middle of a briar patch. I was born there. My earliest memory of where we lived was on Queensbury Circle, in what is now Berclair Highland Heights. But at the time, it was still in the county, and we were country folks. We were the first family to move into the neighborhood. My father had gotten a medical discharge from the Marine Corps for tuberculosis, so he could not get a job by virtue of having that — nobody would hire him. My mother worked as a nurse's aide at Baptist Memorial Hospital, and Dad drew a pension from the Marine Corps. So while my older sister and brother were at school and Mom was at work, my dad and I were at home together. I went everywhere with him, and he was more important in my life than any other person. One Saturday when I was six years old, it was my turn to get shoes — we got shoes when we could afford shoes, and we kids took turns. So I had to go shopping with my mother instead of staying with my father. My father went to get his hair cut while we were shopping, and he died of a heart attack in the barber's chair. He was 51. My mother couldn't afford the house note, so she rented out our Queensbury house, and we moved back to Locke into a "less shack-y" shack. But she saw that the renters weren't taking care of her house the way she wanted it taken care of, so we moved back. It was a three-bedroom, one-bath, cracker-box house. My brother and I shared a double bed. We had floor furnace for heat. The richest people in the neighborhood had a window air-conditioning unit. The second richest had attic fans. We just had a window fan. The neighborhood was full of kids our age. My two best friends lived on the street. We were rambunctious. We stole apples off the neighbors' trees, chased cats, rode bikes, played cowboys and Indians, Army, kick the can — just did what little boys do. I remember when the rich folks in the neighborhood got the first television. It was a real treat to go watch a program — the whole neighborhood would go! We didn't lack for anything we needed; we just didn't have a lot of what we thought we wanted. When we lived in Locke, most of the kids were in pretty much the same financial circumstances that we were — we were all poor. But when we moved back to Queensbury, I saw kids getting brand-new bicycles when I was not. They had electric trains; I had an old wind-up one. It was then that I realized we didn't have money. I hated school, and I did not ever do well in it. I didn't just try to cut classes, I <<succeeded>> in cutting classes! I wanted to be anywhere but school, and I became a 13-year graduate of Kingsbury High School! I enlisted in the Marines and went to boot camp immediately after I graduated. Being a career Marine was all I ever wanted to be. But my mother wanted me to enlist in the reserves so that my college would be paid for. I told her, "Mom, I just barely got out of high school; I don't see me in college." But she wouldn't sign the papers unless I agreed to go into the reserves. Vietnam was really picking up, and Mom didn't want her baby boy drafted. I did my six months' active duty, then I went to college. I was put on academic probation by the end of the first quarter! I went for the second quarter and didn't do a whole lot better. So I left school and went to work for Holiday Inn. I worked at the original Holiday Inn on Summer Avenue. I began thinking about a career with them. They sent me to innkeepers' training classes, and I loved the hotel business, loved meeting people. They sent me to Lansing, Michigan, where I worked double shifts. I met my wife Bobbie in a motel room in Lansing. OK, OK, it was in the dining room at the Holiday Inn there! She was a close friend of one of the waitresses. We dated for a little more than a month, and on Dec. 5, I asked her to marry me. On Dec. 7, she said yes. She met my family over Christmas and returned to Lansing. I left for Nashville to try college one more time, because I felt I needed a degree to go further with Holiday Inn. I did not see Bobbie again until mid May. College still wasn't working for me, so I came back to Memphis to work at the Holiday Inn. Bobbie moved here, and we got married June 18, 1966. We moved into Krag's Mobile Home Park. Several jobs later, I joined the fire department in 1972. I'd been trying for years. I've always been interested in first aid and medical assistance, and they had their own ambulance service. I wanted desperately to work on that ambulance! They told me I couldn't because I wore glasses, but really it was nepotism blocking me. I finally got on as a civilian dispatcher, and I did that for 25 years. According to plan, Bobbie and I waited three years to start having children, and we had Kennison in 1969 and Lyn was born in 1972, also as planned. We didn't have health insurance. We stayed in hock a year and a half paying Kennison off — we had to buy him from the hospital! Sometime in the mid '80s, the fire department union held a fundraising drive for the scholarship fund. The two girls heading up the drive worked in my office. They were selling Santa parties at private homes to raise money. But they booked more parties than they had Santas, so I said, "I'll do one or two for you." I've always, always loved kids, thought it would be fun, and I wanted to help the two girls out. No training, no tips or hints on how to do it. I didn't even practice my "Ho-ho-ho"! I just put on the suit, drove to the house, and winged it — and I still wing it! And when that first gig was over, I was hooked! I said, "Man, this is fun!" I knew I was going to do it from then on. Word spread. The next year, I bought my own Santa suit from Sears. I did Santa for Oak Court Mall the first year it opened. I've done Mall of Memphis. I've been Santa for the Enchanted Forest Festival of Trees for six years. My daughter started elf-ing for me when she was 16 because she could drive, and I'd let her drive us to the jobs. In 1998, I got a call requesting me to do a Coca-Cola promotion at K-Mart. It was a very big deal, but it conflicted with my Toys for Tots commitment with the Marine Corps. So I asked my son Kennison if he would be interested. He'd seen me doing Santa, and he said yes. He went to K-Mart and sat on a throne made of Coca-Cola twelve-packs! He loved it as much as I did, and now Santa Jr. handles his own Santa jobs! Being Santa has been a lot of fun for a lot of years. I just really love children, and I always have. It's the way I'm made. Every day of the year, 24/7, I am Santa Claus! If they made a training manual for Santa Claus … they couldn't. Every kid is different. Every parent is different. Every situation is different. You just make it up as you go along. If you truly love children — and I do — you just know what to do. Be yourself. Keep it simple and on their level. Be honest with them. The trick to a good ho-ho-ho … is to make it come from deep down within. The first time I saw Santa Claus … I honestly can't remember, but I do remember going to the Enchanted Forest when it was in Goldsmith's basement. Before that, they had a Santa Claus in Court Square in a big house. I would have been about four or five years old. From my father, I got … that I've never met a stranger. I can talk to anybody, any time, about almost anything. The most important thing Dad taught me was to be honest. He always had a pipe. When he could afford it, he'd buy Prince Albert in a can, which was the cheapest pipe tobacco he could find. From my mother I got … a perfect example of living a Christian life. She also taught us that we were only entitled to what we had earned by working. She could also be a little stubborn — I got that from her, too! During my childhood, Santa … would "visit," although like most kids, we never saw him. I still have some of the toys Santa brought to my brother and me. We had a Christmas tree; we put out cookies and milk; we made a list — though just because something was on the list didn't mean I would get it! I always hoped I'd get at least one item. But we were always happy with what we got on Christmas morning. I remember being just as excited to receive an article of clothing as the kid next door was about getting a new cap gun. My father's tuberculosis … I was only six when he died, and I wasn't aware he had it until after he passed away. But we had to be careful about what kind of contact we had with him because tuberculosis is an airborne disease. We were never a big hugging and kissing family. I thought my dad was like any other dad except he couldn't work. As a child, I wanted to grow up to be … a Marine. Like my dad. I found out there wasn't a Santa Claus … Well, there is a Santa Claus! I just found out there are different Santas. It was probably somewhere around age 10. I think it was on a Christmas morning when a bicycle I'd seen at a relative's house was suddenly my bicycle under the tree. When I told my son there wasn't a Santa … I don't think I ever did tell him. I did like most parents and just sort of let that "osmos"! I was having as much fun being Santa to my kids on Christmas Eve as any other parent. As long as the kids were game, I was game! The part of my Santa suit that gets the dirtiest first … Oh, I get stains all over. Whatever can come out of a child, it has been on my suit! Santa's outfit … is expensive! A good beard and wig can cost more than $1,000. There was a pair of Santa boots I wanted to buy, but I couldn't pay the $1,500 for them! I have my suits custom-made now. Each suit costs between $500 and $700, and I keep several on hand so I can swap them out during the season. One of my strongest childhood memories … When I was about four, we took some old toys to Toys for Tots. My father explained how the Marine Corps would give those toys to children who had very little or nothing to play with. The year my father died, we children were invited to a big Toys for Tots meal in Millington, where we had dinner with the Marines and sailors at the naval base. Santa Claus came in a helicopter, and I can tell you to this day what toys I received: a black and white checked shirt, a softball bat, and a baseball glove. I was just as excited as if it had been a million dollars, and I wore that shirt until it went to rags. It wasn't until later that I realized we got the toys because we were orphaned and poor. At the time, I thought it was just because we were special! As Santa, I never tell children … what they're going to get or not get. I always say, "You'll be happy with everything you get." The most common wish I hear … for boys, electronic games. For girls, it's still a doll, in one fashion or another. The most unusual gift wish I heard … cheese! I keep from overheating by … You don't keep from getting overheated. If you find out how to do that, tell me! You're going to be hot. Remember, I'm naturally padded and insulated. Then I put on extra padding, then velvet — which doesn't breathe — then a wig and a hat. You can wear a frozen cooling vest that's good for a couple of hours max, but then it melts and it's just more weight. My pant size … is 44. When I pad up for Santa's pants, I'm a 48 or 50. My padding ties in the back — it looks like a baseball umpire's chest protector. The part of Santa's suit that wears out first … the seat of the britches and top of the knees where children sit. Children on my knee have taught me … to be in the moment. That's how they live. It's hard not to be that way with kids! I mentally prepare for my gig … by laughing a lot! But honestly, I don't think of it as "preparing" — I'm just always that way, whether I have a Santa suit on or not. Breath mints or gum? … Wrigley's Winterfresh gum. If I think about it, I wear a little bit of Old Spice. My father wore it. One of my most memorable civic engagements … A terminally ill little boy in Le Bonheur Children's Hospital was telling people that he wanted to live long enough to see Santa Claus. A nurse called me one Friday night and asked if I could come Sunday. I told her that my hair and beard weren't bleached, but she said, "Just come." She told me he loved Lego building blocks, but he couldn't coordinate his movements well enough to play with them. Bobbie and I found 1,000 giant Lego blocks, and I dressed in my Santa suit and took them to him. The little boy, his family, and I played with those Lego blocks for about an hour and a half, and then I left. The nurses told me that my visit was all he talked about. He died two days after my visit. The hardest part about being Santa … is not getting angry with parents and grandparents when they don't let kids be kids. It doesn't bother me when kids pull on my beard. It doesn't bother me when kids fuss and squirm because they're tired. They're kids! When parents start getting mad at the kids, it upsets the kids, and that upsets me. One question I had to scramble to answer … There have been so many of them that I don't recall one particular one! My favorite cookie … is the one that's closest to me when I reach for it! The most common one that's left out on Christmas Eve with the milk is chocolate chip. The number of hours Santa works during the season … You start a month before Christmas. For shopping mall work, you typically work 10 hours on your short days. Closer to Christmas, you can go up to 14-hour days. 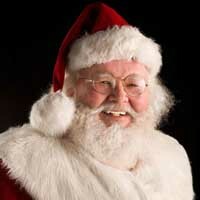 Today, Santas can make anywhere from $20 to $200 per hour. I grew my own Santa beard … when I retired from the fire department in 1997. My favorite reindeer is … Dunder, which is today spelled as Donner. Why do I favor him? Because his name got changed! My Santa business card … includes my rank (chief of the North Pole Volunteer Fire Department), my service number (91224 — nine reindeer on Christmas Eve), my height (elfin+), my weight (jelly-filled), and my workshop's email address (northpolevfd@gmail.com). Makeup-wise, I wear … a flesh-toned powder, more to knock the shine and glare off. I'm aiming at making a good photograph. I do a little blush. I get my hair bleached blond, and then I spray it white. One of my more emotional moments as Santa … There are many of them. I remember a five- or six-year-old girl standing in line at the Mall of Memphis. Over the years, you get a feel for watching kids, and this little girl didn't look like the rest of the kids. I couldn't figure out what it was. She got on my lap, and I started talking to her. Her mother said, "She went deaf this year from a sickness. She can't even hear thunder." The little girl was just beginning to learn sign language. It so happened that at the time, I was working with Civil Air Patrol, and they were learning sign language. This little girl and I fumbled around for about five minutes through a conversation of finger spelling, signing, mouthing, and writing notes. She told me she wanted a little blond doll. The last thing she did before leaving my lap was look at me and sign, "I love you a lot!" I had to take a break after that! The advice I gave my Santa son … I only gave him pointers if he asked. But I do remember us sitting in a restaurant discussing how to put on makeup. That's not a conversation you see two adult men having very often! One trick to make a child stop crying … is do something silly — quack or bark. Or ask them a silly question that they'll have to think about. As soon as you get those little gears turning, they stop crying and start trying to figure out why you asked what you asked — and what the answer is! My favorite Christmas carol … Gene Autry's "Here Comes Santa Claus." It's the ringtone on my cell phone during the holidays! Outside of the holidays, my ring tone is the Marine Corps Hymn. The biggest difference between being a Santa 25 years ago and being a Santa today … I no longer have to put on a false wig and beard! The amount of time I spend per child … is determined by the length of the line of children waiting. If there's no line, we'll sit there forever. My final 2 cents … Be yourself. Be kind. Be in the moment. Believe.